Ronald Says - memoirs of a music addict: I could just scream! Let me start by saying that I'm a huge fan of Chris Cornell. I think he's one of the best rock singers ever. I love Soundgarden, Temple of the Dog, Audioslave and his solo work. His last album "Carry On" wasn't that good but you can't have a hit every time. When I heard that his next album would be produced by Timbaland it raised a few eyebrows. But maybe I was in for a surprise. Unfortunately the songs I heard on the internet didn't promise a lot. I don't like the modern R&B music and definitely not the Timbaland productions. So a bit worried I was heading to Paradiso but I tried to stay open minded. The gig was one of the few album presentations in Europe. He was going to play an integral version of his new album "Scream". So they kicked in with the album opener "Part of Me" which didn't sound too bad live. Unfortunately it only went downhill from there. It's hard for me to say but the songs are horrible. This is not due to the fact that it's not rock but only because they're just not good. In my opinion a producer should get the best out of a performer but I guess Timbaland didn't know who he was dealing with or didn't care. Chris is no Justin Timberlake. 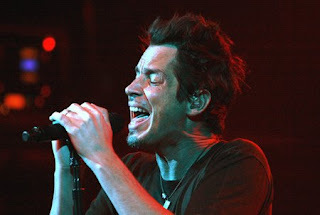 Chris is one of the greatest singers and you need to make him howl and scream! Nothing like that. His singing just sounds really flat on the album and even live. The songs are just stuffed with horrible sounding electronic effects, samples and (synth) string arrangements. The crowd seemed to be shocked since they were very quiet and you could hardly see anyone move. When they finished playing the album Chris thanked us for trying out "new music". Then they played some requests like "Spoonman" and the more than brilliant "Say Hello 2 Heaven". Paradiso exploded for a moment! Probably relieved to hear these great songs and Chris singing his guts out like in the old days. Even "You Know My Name" not one of his greatest songs sounded good. But after only five old songs it was time to say goodbye leaving a dissappointed audience (telling from the reactions: throwing plastic cups to the stage). Sorry Chris, there's nothing new to this. I respect musicians that try experiments. It's a huge risk since it may turn out bad. That's what happened with this album. Very disappointing I'm sure but just keep on going and make a killer album next time. I should give it a 1 out of 5 but will give it a 2 out of 5 out of respect for a great singer. I can echo your observations. I suppose the band didn't feel like playing much more after the entire new CD and a few old tracks, which, as you mentioned, were received so much better that the timbaland stuff. The audience didn't seem impressed by the new material, and neither was I. Just slight movement during the cd presentation. I was annoyed by the background track playing along, as this effectively eliminated any improvisation. Timbaland might be fine for Nellie and Justin, but definately does not do right to the voice of Cornell. The difference with LL 2007 has to be meassured in magnitudes, as it was so much better than this very disappointing performance. KinkFM was supposed to interview Chris, but he wasn't to be found after the show, so no interview. Yes, there was no improvisation whatsoever. The gig at Pinkpop2009 was certainly better because of the old songs they were doing as well. Let's hope the Soundgarden reunion rumours are true.